STKIP – STKIP PGRI Pacitan is one of the private university is Pacitan regency which focus on education field and active in creating many educators since many years ago. This campus is in collaboration with Jatim Bank as the partner of finance manager. To be good campus, STKIP always improve their service from education quality until human resources. For actualize all of that, this campus need to be supported by big budged and good finance management system. Therefore, good service is the first concern of this private university to increase students’ satisfaction and optimize the campus credibility, especially in finance sector. New building beside chief of study program room proof it. 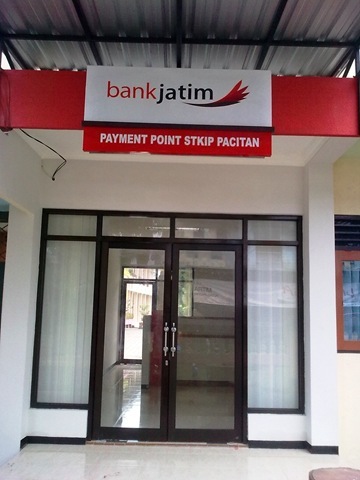 There was built Jatim Bank payment point as the place to pay school fee. So, each student does not need to go to the bank anymore, they just come to payment point in STKIP PGRI Pacitan then pay it directly. One of philosophy lecturer, mr. Afid Burhanuddin said that this payment point is not only for campus interest but also for people around the campus or all customers of Jatim bank who need to make transactions. But, unfortunately there are no body who can confirmed when this payment point will be operate exactly. Based on rumors, it is going to be active on new academic year then every student who will pay quarter of a year school fee, they are able to use this new facility.